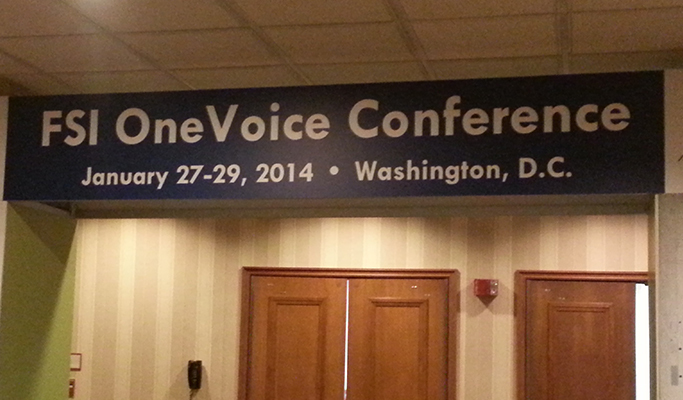 FSI’s annual conference, OneVoice, is officially open! This year is especially exciting as we are celebrating a Decade of Results, and because of our engaged members, we are proud to be celebrating 10 years of advocacy and growing our voice in Washington, D.C and states. Today, we will hear from John Spence, one of America’s top 100 business thought leaders, for the Opening General Session, which will focus on several specific themes that he has identified as fundamental to running a successful business. These include the ability to handle change elegantly and the method to set a winning strategy. He will also share his “Formula for Business Success” which is based on four essential elements necessary for building a sustainably successful firm. Come prepared to learn new and valuable information that you can take and apply immediately to improve the success of your firm. For those who are attending, the new FSI App has all the information you’ll need on-site for OneVoice – it will include access to the OneVoice agenda, speaker bios, exhibitor information and more, and is available for Apple and Android devices. This all-in-one app also provides mobile access to FSI’s Advocacy Action Center, 24/7 industry updates, information about upcoming FSI events and the latest news from FSI. Download it now at financialservices.org/app.